Over the weekend, I did a girls ride at San Lee, it was a fun, leisurely ride. I think it took us about 3 hours to finish the entire trail (11 or 12 miles) but we spent a lot of time in Free Fall and even went back through Free Fall to show Beth how to get over some of the rocks. And then right towards the end of Free Fall, I realized I wasn't picking the right line and tried to turn and get up to the rock line and ended up slipping and falling off my bike, slamming my left hand on a very hard rock and getting the bottom of my palm bruised and swollen. Fun times. Nobody saw the fall and I got up and just started walking my bike to get out of Free Fall. It took maybe another five minutes before I felt like I could grip the handlebars well enough to start riding and finish the last section of Free Fall. 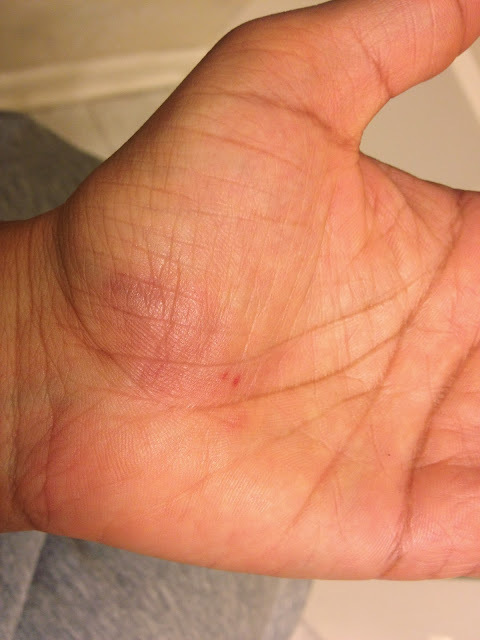 I was little annoyed at myself for falling for no reason and my throbbing hand reminded me of the fall for the rest of the ride. I don't think the picture below does justice but it still hurts a bit when I put pressure on it. On Sunday, we went for a local ride at 286 and I got to see the new trail being built there but I was again out of sorts. I wiped out twice within the first 2 miles and my stomach hurt from something I ate the day before! So I quit after about 10-11 miles. Not the best biking weekend for me but definitely not the worst either. 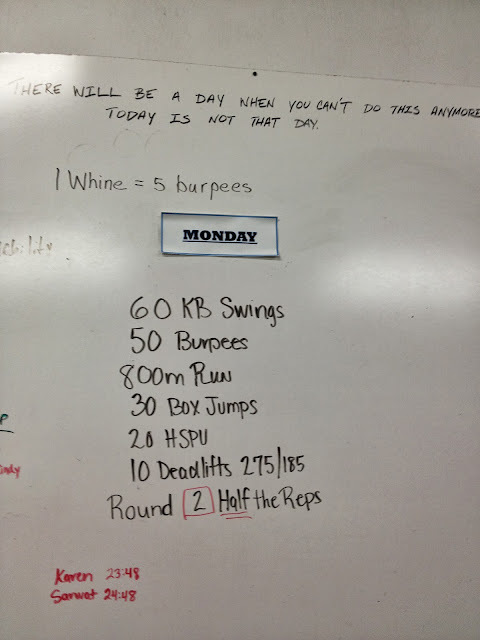 The hardest parts were the handstand pushups and the deadlifts but it was all good and my hand didn't hurt. Ouch! Looks like there's internal bruising, so it would be more painful than it looks! Don't use your face either. It hurt for 2 days but almost 95% recovered now. You have to be really out of control to face plant! I shouldn't have made the last comment since a few days later, I end up face planting and didn't feel like I was really out of control when it happened! Karma will get you every time. Friday cardio WOD and deadlifts! Thursday Back squats and Presses!